This week, Year 1 and Year 5 visited Salisbury Cathedral for Mathematics workshops. These stimulating days focused on developing mathematical vocabulary, reasoning and problem-solving skills. Pupils took part in a selection of active and engaging workshops creating a sense of curiosity and wonder to inspire engineers of the future. Staff at the Cathedral praised our children's knowledge of mathematics and their excellent behaviour. On Monday some children in Key Stage 2 from three of our local cluster schools got together for a fabulous morning of Mathematics led by Maths Leader's from Winterslow, Winterbourne and Old Sarum. The children experienced a variety of activities helping them develop reasoning, problem solving as well as their key facts in addition and fractions. The children showed perseverance and learned that true mathe-maticians don’t give up when faced with a challenge but keep trying new things and use their existing learning to help them solve problems. These children are our second Cluster Maths Ambassadors. On Monday 20th November the East Salisbury Schools Cluster came together to deliver a Maths morning to Year 2 children. The children had an opportunity to explore a range of Maths activities working on key skills and reasoning. As well as experience best practice Maths sessions, the children became Maths ambassadors taking the three activities back to their school to share with their year group. This November, lots of schools are taking part in Barvember - a special Maths month to practice problem solving skills with the bar method. Each day, three different challenges will be posted; it would be fantastic if some children at Old Sarum tried to solve them! I would love to hear about the methods you tried and even better if children show some of their working out for display. What is Barvember? What’s the point? Barvember is organised by White Rose Maths to encourage everyone to use the bar model. We believe that the Bar Model is a useful tool for helping children visualise and then solve maths problems. Even some of the most complex problems can be seen much easier when represented visually. Barvember provides an opportunity for everyone to just do some maths. We know that the bar model is not the ONLY way of visualising a problem and we also know that these problems can be solved in the other ways. This week was another cracking week of magical maths. In fact, this week was PARTICULARLY magical, as we had a guest appearance from our very own Mathemagician. He had an amazinggg time with the children, and taught them some really exciting stuff! The second activity this week feature some super fun 'maths showdowns' in our Maths WHIZZards game (based on a scene from a famous film about young whizzards!). Children had to test their speed in this game. This game helps children with a variety of important areas, including recalling and using addition/subtraction facts up to 100 and telling and writing important times on a clock face. We eventually whittled down to the winning teams, who were very pleased. Well done guys! This activity is a great one. It's called the 'Magic Cauldron' and really helps students with the speed of their sums. They have to pick a card and select another card with the correct answer on. There will be a magic ingredient on the back, which they must add to their cauldron to make a secret potion! 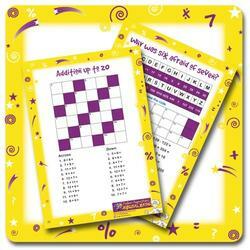 A great game for teaching number patterns and basic times tables. The children stand in a circle and must say either 1, 2 or 3 consecutive numbers in a sequence that we give them. The next child then continues on from there, and so on, and so on. When one child reaches the last number in the sequence, they must make a big (pretend) explosion and sit down. We continue until we're left with a champion. We also played this game with times tables! The Mathemagician was very impressed with their little apprentices. Stately Holmes is a distant relative of the great Sherlock, and has a reputation that's really building(!!) He's worked for some of the biggest crime solving organisations in the world; including the CIA and the FBI, but this week Stately was with us to teach the supercool youngsters a few of his crime solving skills. The children work out the answer to sums in order to Crack the Code. What message did Stately leave for the children……? The Mystery Calculator - helps you to read minds! The second activity our detective brought with him was 'the Mystery Calculator'. This is genuinely really amazing. It's a sheet of numbers that's helps you calculate what another person is thinking. The children were shown how to use it, and tried it on each other. Our final activity this week was some really fun games. 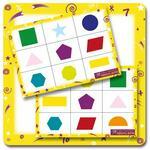 Great for practising important maths in groups. Please note, we change the difficulty of these games according to which year group is taking part - perfect for everyone! Well what a great week this was. We really enjoyed it, and I know our world class detective was amazed by the younger detectives (I reckon they might even take Stately's job if they carry on at this rate!!). For Key Stage One we kicked things off with a game consisting of using our bodies to make numbers. The children were in pairs or small groups and used their bodies to make the biggest number they could. Some did this standing, whereas others were lying down. A super fun game that helps with shape recognition. I hear there were some very close games this week, with some very impressive young mathematicians playing. Fun and Games with Games Galore! The final activity this week was all fun and games from our amazing 'Games Galore' activity pack. We played a game called 'Heads and Tails'. It has statistics and strategic themes, and sparked lots of competition within the group. We eventually whittled it down to just a few who did super-well! A MAGICALLY good first week had by all. We're all math'd out now, and the Professor's taking a rest at the Holiday Inn before his flight home tomorrow morning. Learning objectives: Solve problems to a variety of routine and non-routine problems with increasing sophistication, including breaking down problems into a series of simpler steps and persevering in seeking solutions. Here’s yet another Key Stage 2 puzzle booklet. There is a VERY good reason why we call these mind boggling puzzles. The children solved problems which were capable of boggling even the most capable of minds. Hopefully they will boggle you with them too (sorry in advance)! All students were given a booklet to take home. Learning objectives: Describe position, directions and movements: - Left, right, top, middle and bottom, in front of, behind, next to, between, above, vertical, horizontal - Turn at right angles (recognise that 2 right angles make a half-turn, 3 make three quarters of a turn and 4 a complete turn). The group are split into two teams. One team are noughts and the other team are crosses. An imaginary 3 x 3 grid is set up (using chairs). The aim of the game is to get three children from your team in a row vertically, horizontally or diagonally. Teams take it in turns to position one of their team using directional language. Learning objectives: Practicing addition, subtraction, multiplication and division. 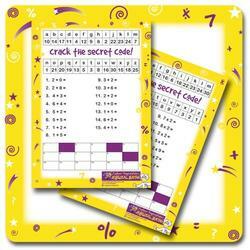 A variety of puzzle sheets matching the mathematics national curriculum (as do all of our activities) including Follow the Trails, Number Name Crossword, Footprints, Number Crosswords, Spellutator and Magical Message, Addition up to 50 and how many fingers wordsearch. 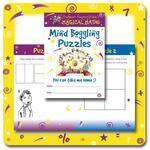 These puzzles are designed to make children think and develop their mathematical abilities while still having fun. The Olympic Mathletes return to your school. We brought the parachute again, played magical ladders and took part in the Mathletes quiz. It was an amazing week! This week everything was sports related as we took our maths adventures to a whole new level! Our Olympic Mathletes came dressed in their sports gear...I have to say they looked pretty good and were raring to go. After hearing "parachute games", the children were very relieved to find out they weren't going to be jumping out of a plane this week (our 'Magical Maths Plane' is still undergoing repairs...maybe next time!). Rather, they'd be holding an edge of our giant parachute and answering maths related questions. We have many activities that we play with this. The first is numbering the children with certain numbers (these can be small if we want an easier game, or larger for a harder game). We then ask the group questions, and if your number is the answer you must run under the parachute to the other side! We then add in large foamy dice to make things more interesting, and play a 'number patterns' game where we number the children in a pattern, they close their eyes while one child goes under the parachute, and when they open them they decide as a group which number is missing. Learning objectives: Convert between different units of measure (e.g. km to m, hour to minute), and solve these kinds of problems. Read, write and convert time between analogue and digital 12 and 24-hour clocks. Standing in two lines facing each other, the children are each assigned a number. A question is called out and the children run down the line round the bottom, they then run up and round the top and back to their place. The winner gets a point for their team (assuming the question is correct of course). It could be as simple as "how many 10’s are in a particular number"
or, it could be harder "multiply two numbers together, and subtract the number of legs on a cow"
or, perhaps "who won are race depending on how long it took two people to run"
As always, questions are appropriate for all ages. Add and subtract amounts of money to give change, using both £ and p in practical contexts. Solve missing number problems using number facts, place value, and more complex addition and subtraction. Estimate, compare and calculate money in pounds and pence. Measure and calculate the perimeter of a rectangular figure (including squares) in centimetres and metres, recognise when it is possible to use formulae for area and volume of shapes, and calculate the area of parallelograms and triangles. Solve addition and subtraction two-step problems in contexts, deciding which operations and methods to use and why. It was a tense game for each year group, but our final winners did mathemagically well. Well done guys! It was an absolutely cracking week this week. Only problem is, we're aching now...they wore us out! A few cooling down stretches are in order I think. Yes the Mathemagician was here again for another fun packed week of magical maths. The Mathemagician enjoyed being creative and playing magical games with the children! 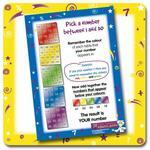 Learning objectives: The 11x table trick teaches children to multiply any 2-digit number by 11. By year 3, pupils should be able to solve missing number problems, and by year 6, pupils should be able to use simple formulae, and express missing number problems algebraically. 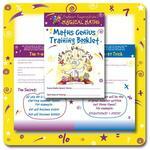 This booklet will train them how to perform some of the Mathemagian's maths tricks. 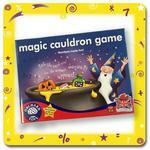 It features some timeless classics such as “The 11x table trick” and a couple of “Magic Square” tricks. Learning objectives: addition, subtraction, and place value to 4-digits. 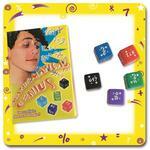 The second activity this week features our Magical Addition Dice. Speed of calculation is of the essence in this game. 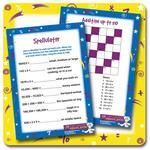 Learning objectives: Recall multiplication and division facts for multiplication tables up to 12 × 12. The children work together as a team and use their multiplication skills to play this game. They throw dice and teams take turns to multiply the numbers on the dice. If resulting number is on their grid a child sits down. The game continues until all of the children in one of the teams are sitting down. This team is the winning team. Hoooray! Stately Holmes is a distant relative of the great Sherlock, and has a reputation that's really building(!) He's worked for some of the biggest crime solving organisations in the world; including the CIA and the FBI, but this week Stately was with us to teach the supercool youngsters a few of his crime solving skills. Learning objectives: The dominoes trick involves practicing multiplication, addition, doubling and subtraction. The recurring number trick involves practicing long multiplication. Key Stage twos did the detective training booklet with Stately. 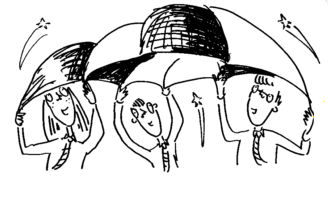 The first trick that Stately went through with the children was the 'Dominoes Trick'. 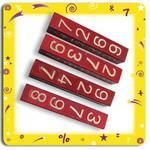 The trick allows you to work out the two numbers on a domino that your friend has picked and you haven’t seen! Also in the booklet were Stately's Recurring Number Trick, which is equally cool. You can try these out with your children at home. Let us know how you find them! The Magical Calculator - Helps you to read minds! The second activity our detective brought with him was 'the Magical Calculator'. This is genuinely really amazing! If your child didn’t bring a copy of the calculator home, please let us know if you'd like us to email you a copy to use. It's well worth it! A 3-digit number (100s, 10s, 1s). A 4-digit number (1,000s, 100s, 10s and 1s). Our final activity this week was Hot Seat! A great team game that gets the children to practice place value. Every child in the teams are given a number, and the aim of the game is to make a bigger number than the other team. Well, what a great week it was! We really enjoyed it, and I know our world class detective was amazed by the younger detectives (I reckon they might even take Stately's job if they carry on at this rate!!). Professor Poopenshtinken wanted to come again in person when he heard that there was another club running at your school! This time the Professor left in plenty of time in order to get a parking space outside the school (apologies if he is in your spot). He was really excited to be heading back! After a few ground rules (like no pulling the Professor's hair) we split the children into groups, keeping them roughly within their year groups and with children of similar ability. These groups then rotated through our three cracking activities. Learning objectives: Develop recognition of patterns in the number system. 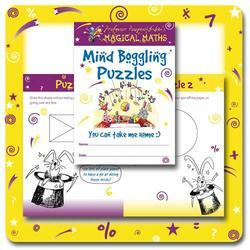 Develop pupil’s confidence in their mathematical ability. Our Key Stage 2 children worked with the Professor and went through the genius training booklet. Students learned some of the Professor's techniques for multiplying any three digit number by 7, 11 and 13 really fast. This trick is not the easiest, but is super effective when pulled off well. With a bit of practise your child will be the local genius in no time! Learning objectives: Recognise the place value of each digit in a five-digit number (10,000s, 1,000s, 100s, 10s and 1s). This is a trick that allows the children to add up four 4-digit numbers on the ‘Mental Logs’ SUPER fast without even using a calculator, other than to check if it is correct…which it will be if done correctly! 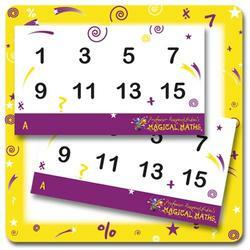 Learning Objective: Recall multiplication and division facts for multiplication tables up to 12 × 12. Use the vocabulary of prime numbers, and be able to establish whether a number up to 100 is prime and recall prime numbers up to 19. The final activity this week was ‘Fizz Buzz’. This is where we got all the children standing in a circle, going around the circle we counted as high as we could. When a multiple of a chosen number came up the student had to say ‘Fizz!’ instead of the actual number. This was REALLY good fun and we continued until we had a WINNER! We also introduced a ‘Buzz’ word too, to make it harder! The secret club has begun. This week the children met 'Olga' the Maths Genius who taught them the mind-blowing 'Squaring Trick'. By the end of the session, all of the children could square numbers in their head! "I was taught to do things, I didn't think I could" reported Megan Winter. This week was another cracking week of magical maths. in fact, this week was PARTICULARLY magical, as we had a guest appearance from our very own Mathemagician. He had an amazing time with the children, and taught them some really exciting stuff! 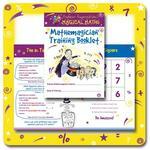 This booklet will train them how to perform some of the Mathemagian's maths tricks. It features some timeless classics such as 'Think of a Number' and the 'Answer out of a Hat Card Trick', and also our personal favourite 'Think of an Animal'. Repetition, along with a bit of showmanship, are what the mathemagician prescribes for making these tricks super slick. The second activity this week features some super fun 'maths showdowns' in our Maths WHIZZards game (based on a scene from a famous film about young whizzards!). Children had to test their speed of calculations in this game. We use different questions depending on age group, but fractions was the focus of the questions. A game featuring two 12-sided dice, and three 6-sided dice. The children get split into teams, and each team rolls their 12-sided dice to create their 'target'. Using the number they then roll from the 6-sided dice, children can use add, subtract, multiply, divide and even powers (for the older children) to equal their target. There's an opportunity for strategic thinking here, and problem solving - which is fantastic! A magical week that's for certain, please let us know what you thought, we love to hear from you and we do read all emails. P.S. - Next week we have a visit from the Olympic Mathletes to do some sports and games. No P.E. kit necessary, but an Olympian attitude DEFINITELY is! This week was Mathletics week which meant our Olympic Mathletes were at your school. We had a parachute, some beach balls and even some football. It was an unbelievable week! This week everything was sports related as we took our maths adventures to a whole new level! Our Olympic Mathletes came dressed in their sports gear...these guys are so sporty they make Jess Ennis and Mo Farah look like a pair of pensioners who brought stilettos instead of trainers to a work-out! We have quite a variety of activities to make sure they are appropriate for each year group. Standing in a circle, a beach ball is thrown into the air. Children must catch it, and then see where their thumbs land on the ball. 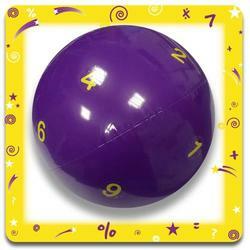 There are different numbered regions on the ball, so the activity leader will then shout an instruction and the child must answer it. It could be as simple as "add your numbers together"
or, it could be harder "multiply your numbers together, and subtract the number of legs on a cow"
or, perhaps "subtract your numbers, and name a shape with that many sides"
As always, questions are appropriate for all ages. Reception children get more basic questions than the year twos, and Key Stage 2 get different questions again. We had a (foot)ball with this game today! 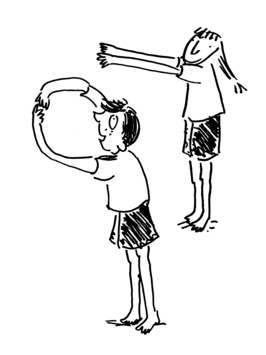 The children have to split into pairs to play a football based board game against each other. They pick teams, roll the dice and have to solve the sum given to them in the top corner of their board. Each correct answer gets them closer to their opponent's goal...and they player with the most goals at the end wins. Key Stage 2's must recall and use multiplication facts for the times tables up to 12x12. 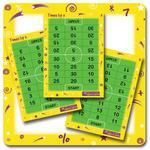 For those mini maths genius', we have goal boards with multiples of 13, 15, 20 and 50. It was an absolutely cracking week this week. Only problem is, we're aching now...they wore us out! An all-time Magical Maths favourite...our second activity this week was number chaos. We loooooooove this game. It features two teams who each have to hold a double sided, numbered card. Our activity leader shouts out a sum, and the team have to race to lay their cards out on the floor with the correct answer. It's tough, it's tense but most of all it's mega fun. It's also perfect for adding in the harder questions to stretch and challenge Key Stage twos, whilst also working really well for Key Stage ones as well. We really enjoyed number chaos this time round! We ended the week with some puzzle sheets. These sheets are specially designed to match the curriculum (as are all of our activities), and to make children think and expand their mathematical abilities. They still follow the theme of fun, but will definitely challenge them and teach them something new. Well there we go, today was the last day of our "Magical Maths Training" sessions. 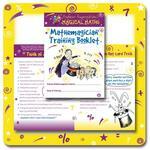 We've got some pretty sad looking Magical Maths leaders here at HQ...I think they've enjoyed being at your school. I really, really hope that the children have had as much fun as we've had working with them! Could I just ask if you could give me an email back with your feedback from the club? What did you and the children think? Please let us know as we love reading your emails. We also take feedback very seriously...it helps us to keep providing the best clubs and making sure they provide more and more value for parents and students. 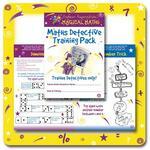 Magical Maths invite you to join our secret club! Magical Maths is a 6 week club where you can meet some crazy and wonderful characters and learn some truly mind-blowing Maths tricks. You will learn how to calculate impossible numbers in your head, read minds, play Maths sport and solve unbelievable puzzles...all with the power of Maths. So come along and join in, it won't be the same without you. Cost is £42 for the entire 6 weeks.